Casting a horoscope requires knowledge of the relative positions of the Sun, Moon, stars and planets in order to draw conclusions and make predictions. One of the fundamental calculations in astrology is the position of the Sun relative to the signs of the zodiac. The path of the Sun as seen from Earth is called the ecliptic and the astrolabe calculates the position of the sun on this path. The ecliptic is divided into 12 equal sections, representing the signs of the zodiac, so the position of the sun on the ecliptic determines the zodiac sign it is in. 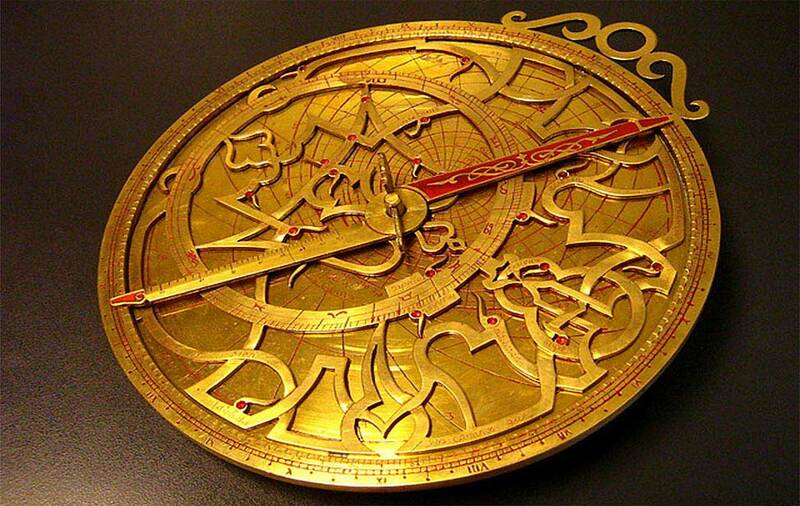 The use of an astrolabe simplified greatly this process, enabling non-mathematicians to calculate positions and angles of the heavenly bodies. Astrological works were widely available, and astrological calculations were among those considered most important in texts on the astrolabe. The treatise on the astrolabe attributed to Messahalla explains 47 uses of the astrolabe, of which about half are directly related to astrological calculations. Collections of tables were often included with treatises on the astrolabe explaining how to derive things like the length of someone's life from astronomical data obtained with the astrolabe. Engraved on the back of some astrolabes are tables of astrological information, such as the signs, their "lords" and characteristics. Scales of purely astrological use are found on the back of some very small astrolabes (on which space would have been at a premium), further indicating the importance of astrology to Arabic users of the astrolabe. Judicial astrology (the prediction of future events from the heavens) was more acceptable to Islam than to Christianity since it was not seen to threaten free will or the authority of Allah in the way that astrology was seen to threaten the sovereignty of the Christians' God in the medieval period. In the Qu'ran it is written that God created the stars and that men should be guided by them, indicating the more accepted place of astrology and astronomy within Islam.